While the roundabouts near Sharpes Corner on SR 20 in Anacortes have been operational since late June, we’re about to wrap up the last bit of landscaping and officially put a bow on things. That means it’s time to celebrate! To mark the completion of the $13.4 million Connecting Washington safety and congestion improvement project, we are holding a ribbon cutting with our contractor, Tapani Underground at 11 a.m. on Tuesday, Oct. 9. We’ll share the successes of the project (spoiler: it was completed within budget and ahead of schedule) and hear from some of our community partners who helped make this project possible. The event will also include an opportunity to walk or bike the new trail that was also part of this project. 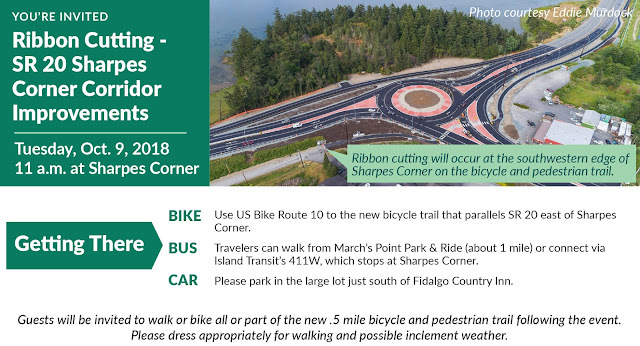 The trail helps better connect pedestrians to businesses in this area and bicyclists to US Bike Route 10 across Washington and Bike Route 3 down Whidbey Island. You can check out photos of all the stages of work in our Sharpes Corner Flickr album, which is also where we’ll post photos from the ribbon cutting event. If you can’t make it out on Oct. 9, we hope you’ll check out this corridor and try out the new trail too. If you have questions or feedback about this project, you can reach out to me at Andrea.Petrich@wsdot.wa.gov and you can read more about navigating a roundabout by clicking on that link and reading a recent blog.